Harworth Estates has completed its seventh phased residential land sale at its flagship Waverley development in Rotherham, where the council is close to completing a second deal for its speculative commercial development. Approved in 2010, the largest, most complex, planning application ever considered by Rotherham Council gave outline approval for South Yorkshire's largest ever brownfield development, creating a new 3,890 home community across 741 acres. The £100m development is also set to have a hotel and wide range of shops, cafés, health, leisure and educational facilities. Developer and land owner, Harworth Estates, the company created to realise the property assets of what was UK Coal, has sold the latest part of the site to Harron Homes, who already has plans approved to create 81 further family homes on 2.64 hectares. Housebuilding began in 2012 on the first of four planned phases in character areas called Highfield Spring and Highfield Place, across from the expanding Advanced Manufacturing Park (AMP). The masterplan has been updated, centring around the next character area, know as Waverley Central, where approximately 600 dwellings will be built. Harron, alongside, Taylor Wimpey and Barratt have all had success at Waverley, with more than 250 houses built and occupied over the past two years. Duncan Armstrong-Payne, development manager of Waverley for Harworth Estates, said: "I am thrilled to extend our relationship with Harron at Waverley. The huge amount of work we and our partners, such as Harron, have completed in 2014 has brought our vision for the scheme to life, and we look forward to welcoming more residents here in 2015 and beyond." 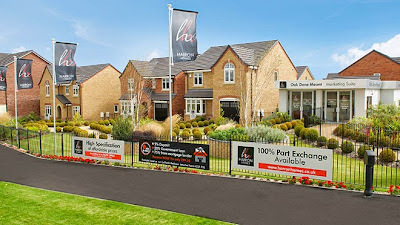 Kevin Chapman, land manager of Harron Homes, added: "We already enjoy an excellent working relationship with Harworth Estates and we have been impressed with how Waverley has developed as a community over the past two years. Purchasing another phase of development therefore makes total sense for the company." 571 residential plots have now been acquired at Waverley with the further development supported by a £10.95m local infrastructure loan from the Homes & Communities Agency. On the AMP, Harworth Estates signed a £4.3m forward-purchase agreement with Rotherham Council in March for Plots 3 and 4 of the R-evolution development. X-Cel Superturn, a global manufacturer of machined components, has bought a 30,000 sq ft unit from the Council for £2.75m in order to triple the size of its operation and yesterday the council's cabinet met to approve the sale of the remaining plot.